White Vinegar 2 teaspoon or 1 tbl spoon , depending on the quality and tartness..
1. Marinate the chicken cubes with the ingredients mentioned for marinade. Keep it aside for half an hour. 2. Heat Oil and deep fry the chickens until crunchy. 3. In another bowl , combine all the ingredients mentioned for sauce. Mix well until the sugar dissolves completely and set aside. 4. Heat the wok , add 2 tbl spoon of sesame oil. Add chopped ginger, chopped garlic , chopped scallion , chopped green chilies and dry chili , Fry a little. Add the chicken pieces and stir fry for 30 seconds. 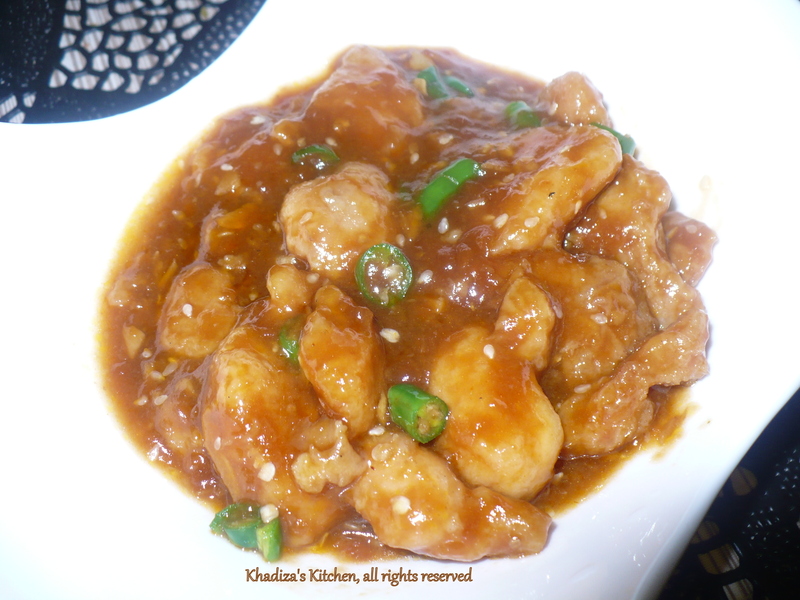 Add sauce mixture to the wok and cook stirring until the sauce becomes thickened. Add the roasted sesame if you want. 1. If you don’t have brown sugar , you can alwayz substitute regular sugar for it. 2. To enhance the color , you may add 1 teaspoon of caramel too . Then omit extra half teaspoon sugar. 3. Some people add Coke or Pepsi to enhance the color and flavor. I haven’t experimented yet, but If you want , you may experiment. 😀 .. But careful , Coke is very sugary , so it will get caramelized with the heat and will become so tough . So add proportionately and cut the sugar amount mentioned in the recipe. 4. Don’t add any extra salt as the sauces contain salt. 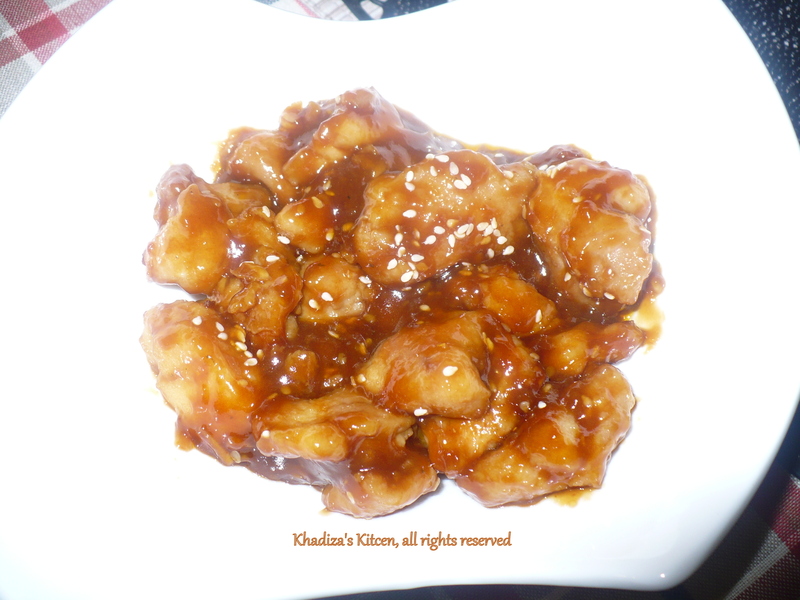 This entry was posted in Chicken, Chicken and Poultry, Glossary / Notes and tagged Chinese recipe, Chinese style Chicken recipe, General Tso's Chicken, Tso's chicken recipe. Bookmark the permalink.